Looking for a flavorful and colorful dinner that is also quick and easy? 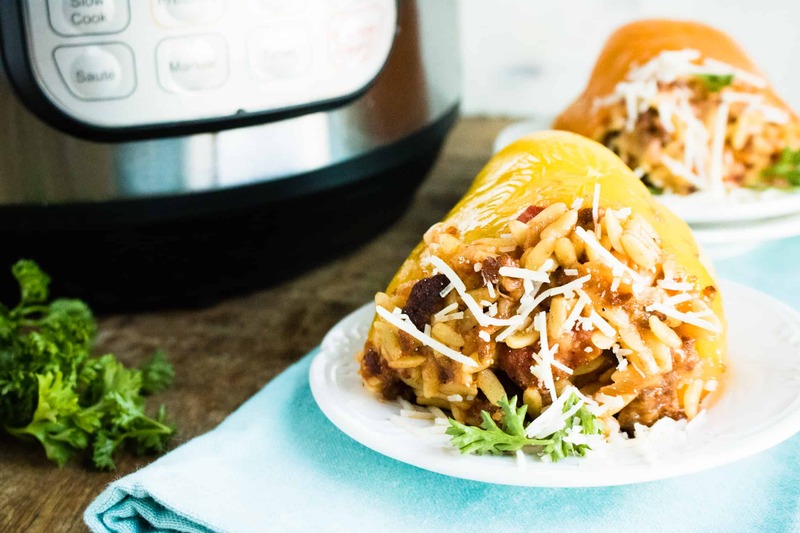 Look no further than this recipe for Instant Pot Orzo & Italian Sausage Easy Stuffed Peppers. With orange and yellow peppers filled with Italian sausage and orzo, this recipe is amazingly delicious and pretty to look at! And thanks to the Instant Pot, it cooks in a jiffy, making it perfect for busy weeknight dinners. 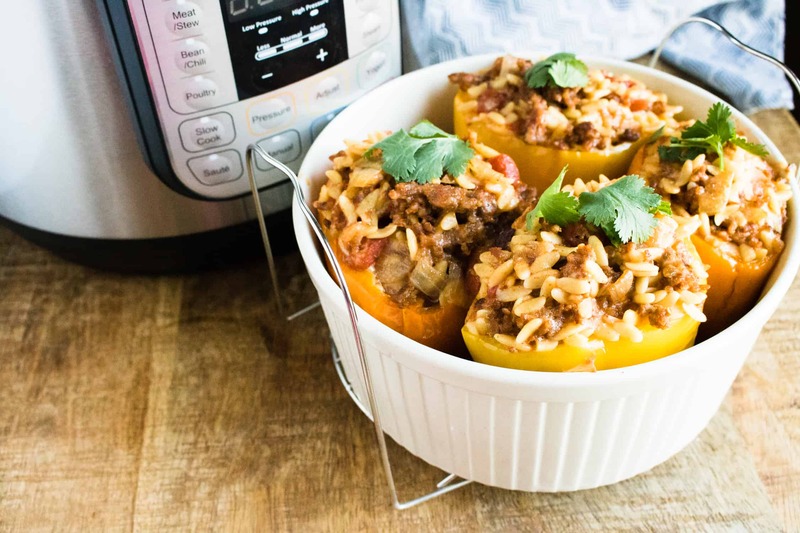 These Instant Pot Orzo & Italian Sausage Easy Stuffed Peppers are made in an Instant Pot, which makes every dish so much quicker and easier! It only takes 10 minutes for this recipe to cook, so you’ll get a delicious dinner on the table in a flash. That is truly something to love at the end of a crazy busy day. True cooks know that presentation of a dish is almost as important as the flavor, and these gems make a beautiful plate presentation so easy! 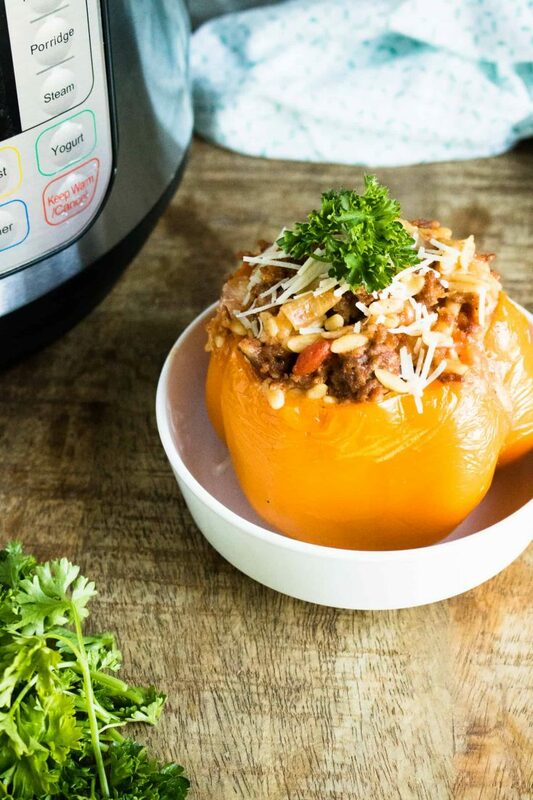 Instead of using just the traditional green bell pepper, use yellow, orange and red peppers when you make this Instant Pot Orzo & Italian Sausage Easy Stuffed Peppers recipe, and your plate will be alive with color. Because it’s always fun to put a little twist on a traditional dish. 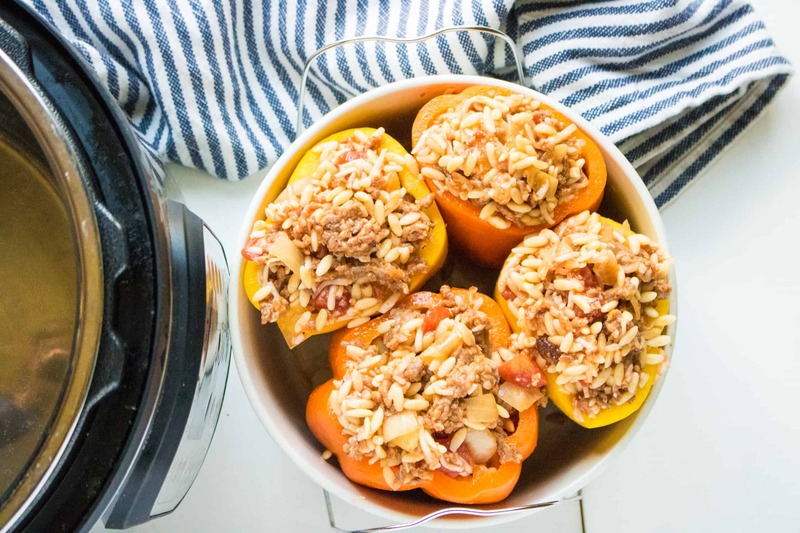 Instead of the usual tomatoes, ground beef, and rice that you find in most stuffed peppers, these Instant Pot Orzo Italian Sausage Easy Stuffed Peppers make it interesting and super flavorful by using orzo and Italian sausage. Definitely not your mama’s stuffed peppers! 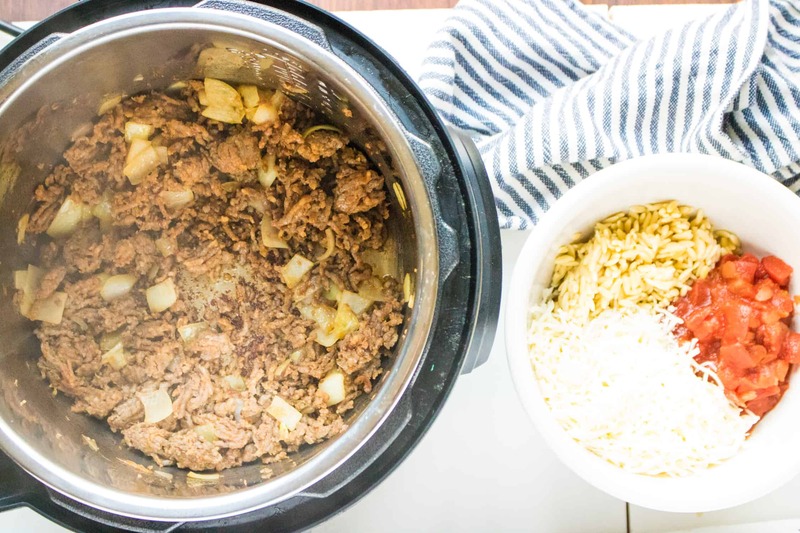 What Should I Serve with Instant Pot Orzo & Italian Sausage Easy Stuffed Peppers? 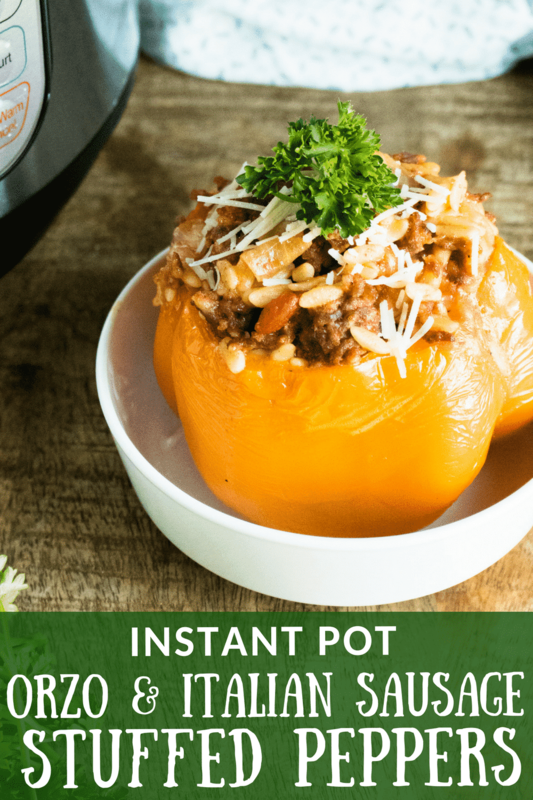 Looking for recipes to serve along the Instant Pot Orzo & Italian Sausage Easy Stuffed Peppers to make is a meal? Check out the suggestions below. Love a salad alongside your entrée? Try this awesome recipe for Italian Salad with Homemade Italian Dressing. I know people that don’t feel the meal is complete without some type of rice or potato. If you are one of those people, try this delicious Garlic Mashed Potatoes recipe! And, of course, no meal is complete without a mouth-watering dessert. Some people might even say it is the best part! Try this amazing Easy Slow Cooker Apple Bread Pudding Recipe and you’ll have dessert for a couple of days! Step #1: Turn the Instant Pot on to sauté mode and brown the Italian sausage with the chopped onion. Remove from pot when done and mix together with the orzo pasta, tomatoes and mozzarella cheese. Step #2: Remove the tops from the peppers, and take out the membranes and seeds. Stuff the peppers with the orzo and sausage filling. Step #3: Add 2 cups of water to the inner pot of the Instant Pot. Step #4: Place the stuffed peppers in a casserole dish that will fit inside the Instant Pot. Put the casserole dish on top of the trivet in the Instant Pot. Step #5: Close the lid on the pressure cooker and turn the valve to sealing. Step #6: Set a manual high-pressure time for 10 minutes. Step #8: Remove from Instant Pot and serve. Enjoy! These Instant Pot Orzo & Italian Sausage Easy Stuffed Peppers are amazingly delicious and pretty to look at! Turn the Instant Pot on to sauté mode and brown the Italian Sausage with the chopped onion. Remove from pot when done and mix together with the orzo pasta, tomatoes and mozzarella cheese. Remove the tops from the peppers, and remove the membranes and seeds. Stuff peppers with the orzo/sausage filling. Add 2 cups of water to the inner pot. Place the stuffed peppers in a casserole dish that will fit in the Instant Pot. Put the casserole dish on top of the trivet in the Instant Pot. Close the lid on the pressure cooker and turn the valve to sealing. Set a manual high-pressure time for 10 minutes. Do a natural release for 4 minutes to let out the pressure slowly, and finish with a quick release.